It has been 23 days since Joe Flacco touched a football field. The veteran quarterback injured his hip on the first drive of Baltimore’s home game against the Steelers. The injury seemed insignificant at first, as Flacco played the entire game hurt. However, it was later revealed that the injury was more serious than once believed. Flacco was spotted on crutches following the loss and he underwent tests to determine whether or not he would need surgery. While the former Super Bowl MVP did not require surgery, he was not able to practice or play since his last appearance on the field. With Flacco out, the Ravens turned to rookie quarterback Lamar Jackson. There was much speculation in a divided fan base to how the rookie would play. One side argued that Lamar Jackson was going to light the opposing defenses up, both as a runner and a passer. The other side was not as confident, claiming that Lamar Jackson was not ready to compete at the NFL level, as he is an undisciplined passer. While both sides fumed from the bye week into game day, neither was exactly right. Lamar Jackson did enough to win against Cincinnati. The bulk of his contributions came on the ground, as Jackson ran 26 times, and only passed 19. The Ravens only gave fans a small sample size to judge Jackson as a passer. While the gameplan won the Ravens the game, a scheme that relies on 26 quarterback runs is obviously unsustainable. Motivated by the need to produce a reusable offensive plan around Jackson, the Ravens put the young quarterback in many more passing situations from the outset of the game. Jackson and the Ravens hoped that this would also quiet the concerns that he could be a viable passer in the National Football League. Instead of achieving this goal, the Ravens raised more questions than answers. The Ravens gave Jackson the opportunity to pass against the Oakland Raiders, especially in the first half. Instead of proving himself to be a capable passer, Jackson only furthered the notion that he is not yet ready to be a full-time starter in the National Football League. Offensive coordinator Marty Mornhinweg gave Jackson 18 opportunities to throw in the first half. Jackson completed only half, nine passing being complete, and nine passing being incomplete. Of the nine incompletions, two were intercepted. On the first interception, Jackson made a horrible decision and threw into triple coverage. (He also did this the previous week.) The pass was tipped and intercepted. Late in the second quarter, the Ravens were driving into the red zone. Jackson targeted wide receiver Michael Crabtree on a fade route but placed the ball behind him. The cornerback covering Crabtree tipped the football, and another defender caught the interception in the end zone. Baltimore only led 13-10 against the 2-8 Raiders at the half, the only touchdown came from a Cyrus Jones punt return. The offense repeatedly stalled out, as Jackson could not be relied upon to get the ball down the field. The more Jackson passed the ball, the more he struggled. In the first quarter, Jackson threw eight passes, with five completions, although two completions went for just one yard. In the second quarter, Jackson increased his throw count to 10, but only completed four passes. Despite the decrease in completion rate (62.5% to 40.0%), Jackson increased his average yards per pass attempt (6 yards to 9.2 yards). This can be explained by the inclusion of an outlier in the statistics. Mark Andrews took a long pass for 74 yards. If that pass is removed from the statistics, the average drops from 9.2 to 1.8 yards per attempt. The drive with the long bomb to Andrews exemplifies the continued frustration on the offensive side of the ball. The play got the Ravens into the red zone, but a careless delay of game by Jackson killed the momentum, and the Ravens were forced to kick a field goal, instead of grabbing six points. Jackson’s struggles calmed down in the second half, but not because he felt more comfortable. The Ravens adjusted the offense and moved from a pass-heavy approach to a run-heavy approach. Jackson threw the ball 18 times in the first half and only 7 times in the second half. His passing efficiency spiked across all statistics. His completion rate jumped from 50% to 71.43%, and his average yards per attempt dramatically increased as well. The average yards per pass of the first half was 7.78 yards per attempt (with the outlier). Without the outlier, it was just 3.88 yards. In the second half, Jackson improved this statistic to 5.43 yards per attempt. Jackson also scored two touchdowns, one through the air to Michael Crabtree, and another on the ground. Perhaps most notably, Jackson gave up no turnovers in the second half. A well-developed quarterback against the Oakland Raiders should have been able to put up better numbers. Against the Raiders, Indianapolis Colts quarterback, Andrew Luck completed 22/31 (70.97%) passes for 239 yards and three touchdowns. Seahawks quarterback, Russell Wilson completed 17/23 (73.91%) passes for 222 yards, 3 touchdowns, and one interception. Chargers quarterback, Phillip Rivers, in his last game against the Raiders, completed 18/26 (69.23%) passes for 223 yards, 2 touchdowns, and one interception. Jackson is not a well-developed quarterback, and as a rookie quarterback, it would be surprising if he was. Jackson did enough to defeat the two worst run defenses in the league but struggled when it was time to pass. None of Jackson’s struggles would matter if he was the only capable quarterback on the roster. He is not. The Ravens are expected to see Joe Flacco return soon, whether it be in week 13 before Baltimore’s game in Atlanta, or beyond. 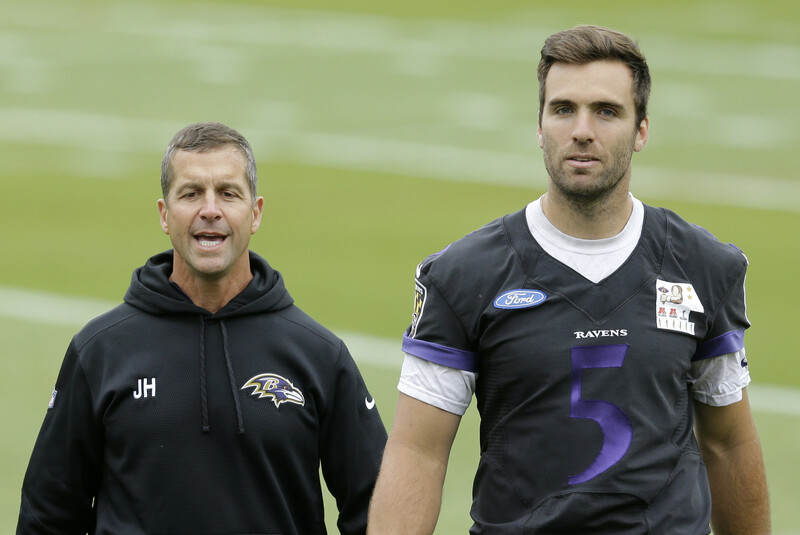 At this point, the decision is a no-brainer for head coach John Harbaugh in this faux quarterback controversy, Joe Flacco is the undisputed starter once he is healthy. Flacco is the more refined passer. He can spread the ball out and open up windows that Lamar Jackson simply cannot. Flacco averages 273.89 passing yards per game, while Jackson averaged just 164 passing yards in his two starts. Flacco’s quarterback rating on the year is 84.2, while Jackson’s is 73.1. When Jackson was asked to pass the most, against a bad defense, his rating dropped to 58.4. The counter-argument one might give to support Jackson is that the run game with Jackson at the helm has been infinitely better than when Flacco was at the helm. This is true. Jackson has contributed a great deal to the run game, not only by gaining 190 yards in two starts but also by creating a read option game to benefit running back Gus Edwards. The rookie out of Rutgers took over the game against Cincinnati and has yet to look back. While Jackson certainly helps Edwards, the Gus Bus should get most of the credit for his own runs. He is a powerful downhill runner that the Ravens offense has been missing in recent years. Joe Flacco is always at his best with a powerful run game behind him. His best years came with running back Ray Rice, and Justin Forsett when he ran for 1266 yards in 2014. If Flacco has a run game behind him once he returns to the field, he will be even better than he was earlier in the season, when the Ravens offense felt electrifying. Lamar Jackson played well enough to win in the two starts that the Ravens gave him. However, the Ravens are facing tougher competition. If the Ravens want to make a playoff run, they are going to need to put the best quarterback on the field. This week’s matchup against the Falcons in Atlanta might be the last time Jackson could start and win. Atlanta’s defense is the fifth worst in the league in total yards given up (396.7), eighth worst in rushing yards given up per game (123.7), and seventh worst in pass yards allowed per game (273.0). Atlanta may prove more difficult than anticipated, however, as the Matt Ryan led offense has the potential to initiate a shootout. This would be a difficult situation for Lamar Jackson to control, as the need to pass the ball would trump the run first strategy which gives him the best chance for success. The Ravens are also slated to play the 9-2 Kansas City Chiefs, the 8-3 Los Angeles Chargers, 4-7 Tampa Bay Buccaneers, and the 4-6-1 rising Cleveland Browns down the stretch. Each of these games will present their own challenges, and Baltimore’s best bet to win each game is by starting Joe Flacco at quarterback.